NYE Dublin is Ireland’s largest New Year’s Eve celebration! The festival harnesses the energy of Dublin City and the vibrancy of Irish talent to deliver a jubilant celebration of the New Year with a jam-packed three-day schedule. 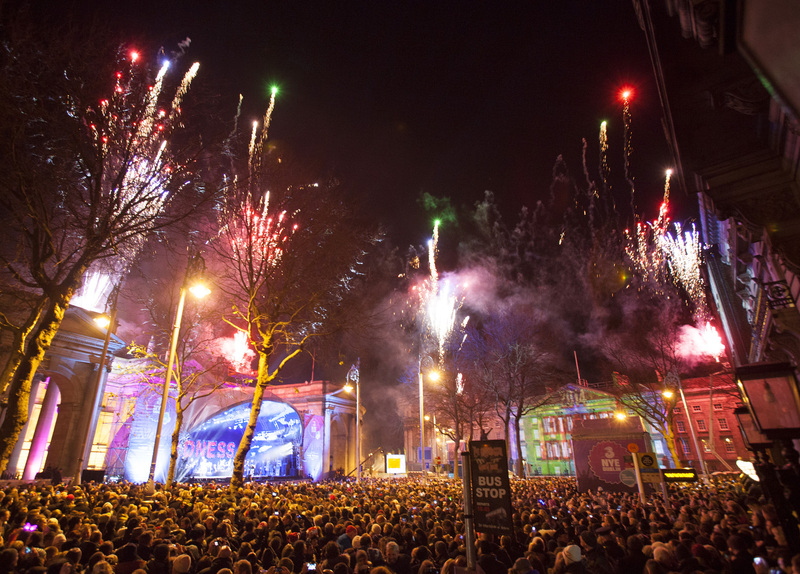 Established in 2011, the festival has grown to become Ireland’s largest New Year’s Eve event with over 35,000 people taking to the streets in 2013 to ring in the New Year and over 1.3 million people tuning into the live coverage on RTÉ. The Countdown Concert saw Dublin’s College Green come to life on December 31st with live performances from Madness, The Sugababes and homegrown acts such as Ryan Sheridan, Walking on Cars and The Strypes. Over 15,000 people from home and abroad attended the concert while 1.3 million viewers tuned into the live coverage on RTÉ. MTV’s Laura Whitmore led the countdown to midnight followed by an incredible display of fireworks over Bank of Ireland and Trinity College.